These robust sapphire cover glass windows have lower bulk absorption and about 30 times higher thermal conductivity than quartz protection glasses. Laser Research Sapphire Fiber Laser Windows feature Mohs 9 hardness which is second only to diamond and have A/R coatings on both sides. Reducing focus shift and the deterioration of beam quality, these cover glass windows are ideally suited as debris shields on 1064 nm cutting and welding lasers. Laser Research Optics has introduced a line of sapphire cover glass windows that have lower bulk absorption and about 30 times higher thermal conductivity than quartz protection glasses. 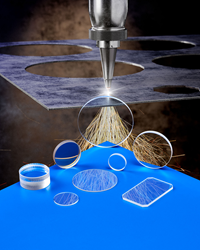 Laser Research Sapphire Fiber Laser Windows feature Mohs 9 hardness which is second only to diamond and have A/R coatings on both sides to provide transmission of greater than 99.5% @ 1.06 microns with greater than 80% @ 650-670 nm. Reducing focus shift and the deterioration of beam quality, these sapphire windows can withstand steel splatter, flash, and debris better than fused silica. Ideally suited as debris shields on 1064 nm cutting and welding lasers, Laser Research Sapphire Fiber Laser Windows reduce the number of required lens changes on high power lasers from 4 kW and above and extend their service lifetime. Providing a 10-5 scratch-dig finish and 1/4 wave transmitted wavefront, they are available in 0.5” and 2.0” sizes. Laser Research Sapphire Fiber Laser Windows are priced according to size and quantity. Price quotations are available upon request.